Many people have certainly noticed that with our planet is something wrong. In all we hear media reports about natural disasters. Large earthquakes, floods, volcanoes, fires, heavy snow, hurricanes and tornadoes are a daily occurrence. Everywhere we hear of wars, bloody riots and strikes. People no longer feel too slow, which is what all happens in the world. One large piece of burning both Russia and China and other Asian states under water. Soptí volcano in Iceland, South America, large earthquakes, floods and landslides. Australia suddenly found itself under water and in New Zealand, a strong earthquake. Another earthquake, floods and landslides in South America, China and giant earthquake in Japan. The massive mortality of birds and fish around the world. The world is littered with senseless wars against terrorism, Arab states move riot of gigantic proportions. Die daily from hunger and disease devastating countless numbers of people. This is just a small selection of what they could find in the media over the past few months. Also, you have surely noticed that the large increase in occult revelation spiritistic shows how in the world and in churches. An increasing number of UFO sightings over many large cities in different countries. You may have seen unexplained phenomena in the sky in a spiral shape and light signs to prevent the revelation of the false messiah Maitrea. Many people gets unexplained abilities like flying, or healing from a distance. Jesus told his disciples in detail how the sign will just before his second coming. All the disciples and we have seen this message for the end of the history of the world read the Bible. Matthew 24,4-8 - Jesus answered them: "Be careful that no man deceive you. Many shall come in my name, saying, 'I am the Christ' and shall deceive many. When you hear the noise of war and reports of wars, look you not to worry. It must come, but it still will not end. Nation will rise against nation, and kingdom against kingdom, and break out in various places famines and earthquakes. All these are just the beginning of birth pains. Luke 21,9-11 - When you hear of wars and riots, do not panic. This must be done, but that's not the end. "Then he told them:" Nation will rise against nation, and kingdom against kingdom. They will be great earthquakes in various places there will be famines and pestilence and horror come and great signs from heaven. What is happening around the world is not normal and not always in such a large scale. Just read some of those statistics and find that natural disasters are rising steeply up. Around the world, riots, famine and disease. The world is overpopulated, crazed and caught up in pain. What is happening in all corners of the world, is the beginning of birth pains as stated in Matthew in the 24th chapter. Many religious people with whom I came into contact with say that the early arrival of Jesus Christ have believed their fathers, grandfathers or great grandfathers. Panicking from every natural disaster and expect an early end to the world. Years pass and the world is still the same, Jesus anywhere. There is no reason to panic says, Jesus will come, but it is not our concern. Just a little think about what it takes to live our faith? We expect soon coming of our Lord Jesus Christ. Even the first disciples believed that Jesus Christ will return in their lifetimes. Zealous and spread the gospel to the world. So our fathers and their zealous faith was alive and honest. They were hunters people to Christ, the gospel spread quickly. Today, Jesus never expected everyone to laugh, which is Jesus the world is still the same and will go on. They say peace and security, nothing happens, disasters and unrest always are. Everyone is only interested in their work, their hobbies, pleasures, of their appearance. Frugality has evaporated revel gluttony and indulgence. We are not interested in our fellow man, I'm ashamed of my faith, preach to the world hope in Jesus, just once a week we go into the stereotype of the Assembly. Churches turned into a club where people go to chat with friends, arranging deals and often look to the theater, which is our course is. The Bible tells us that in the last days scoffers will come. Exactly how it is written is wrong, the faith of our fathers and we cooled down with a mock and our hearts cold. We think we have won, and do believe that is enough for salvation. 2nd Peter 3,3-4 - First, know that in the last days scoffers will come unconscionable conduct their own tastes, saying: "What is the promise of his coming? The fathers have already died and everything remains as it was from the beginning of creation! " 1 Thessalonians 5,1-3 - The times and days you do not need to write anything, my brothers. Yourselves know well that the day of the Lord will come as a thief in the night. When people will say: "Peace! Safety "is suddenly surprised by confusion, as when they come upon a pregnant pain, and will not leak. Noah entered the ark than 120 years, arguing that the world will come in the form of a flood disaster. Everyone laughed at him and took him for a fool and enthusiasts. Their little faith jeering and still life. As in the days of Noah were, so even now. We do not believe that Jesus Christ is coming soon, and despondency scoff at each other. Revel only their hobbies, we are just ourselves. Luke 17,26-30 - As the days of Noah, so shall also the Son of man days: eating and drinking, marrying and giving in marriage, until the day Noah entered the ark. Then the flood came and destroyed them all. Similarly, the days of Lot: they ate and drank, bought and sold, they planted and built, but on the day that Lot went out of Sodom it rained fire from heaven to destroy them all, and sulfur. 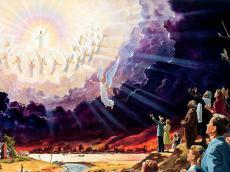 Likewise, it will be the day when the Son of Man will appear. As it is written in the Bible, as is happening today. Our faith is lost, and we fully commit to this world. We compromise on a compromise, I'm diving into abominations and vices of this world. Precisely this moral status is described in the Bible, people will look beyond themselves. 2nd Timothy 3,1-5 - Be sure that in the last days difficult times will occur. People will love only themselves and their money, are boasters, arrogant, abusive, disobedient to parents, ungrateful, unholy, heartless, implacable, slanderers, unbound, unbridled, the enemy of good, traitors, reckless, arrogant, lovers of pleasure rather than lovers of God . Publicly, they are embodied piety, but its power will be denied. From such turn away. Let's look around, the world in the throes of nature is breaking down. Risen in many false messiahs, prophets, seers. The world and religion is connected with spiritism and occultism. Gives rise to various movements that proclaim the coming of Jesus Christ, establish an early date and arguing. There are many false prophecies about the end of the world in early 2012, the Internet and media are literally interwoven with this phenomenon and sensitive people in panic. Surely this is not all random, Satan knows that he has left little time. Going to his last illusion, that we all deceived and misled. Are going to reproduce, the coming of Jesus Christ. Everything is perfectly prepared, it is up to God, which allows him to have full effect. Matthew 24.4 - Jesus answered them: "Be careful that no man deceive you. Many shall come in my name, saying, 'I am the Christ' and shall deceive many. 2nd Thessalonians 2,3-12 - Do not let anyone deceive in any way. Until that day comes, there needs to be turned away from God. They must discover the wicked and reprobate, who opposes and exalteth himself above all that what it says and what God is worshiped. Settle even in God's temple and will issue a God! Do you not remember how I told you when I was still with you? You know what prevents him yet - may in fact occur until that time. The secret of this wickedness, but it works, just waiting for it to disappear the obstacle. When he discovers that the wicked, the Lord Jesus will kill him the breath of his mouth, destroying its brightness it coming. The advent of the wicked will become Satan's activity, all the false powers, wonders and miracles. With all the folly is to deceive those who are heading to disaster, because he did not love the truth, which could save. Therefore, the issue over to God delusion to believe lies. So they sentenced all those who believe the truth but had pleasure in infamy. Let us not be fooled, do not specify the date of the end of the world, do not panic world events and what to expect. It is our task to sit furiously at the newspaper, television, Internet, clinging to world affairs, and woe to tell what awaits us. From the Bible we know that this must happen as predicted. Our task is to prepare, purify ourselves from the fun and indulgence, to focus on Jesus Christ and humble ourselves before God as never ever before. The history of this world is already at its end and the coming of our Lord Jesus Christ is very close. We must continue to idle, we must prepare and preach that message to the world. We must cleanse from all vice and wickedness, in order to prepare us to dwell, Jesus Christ. Let us do penance, humility to try to find and beg forgiveness of all sin and innermost. Only then can we be involved in the late rain, outpouring of the Holy Spirit as the disciples in the days of Pentecost. Preparation now until it's time. Time is quickly running out! Hosea 14,2-3 - Go to Israel, the LORD your God, for you have died for their sin. Return to the Lord and bring word of prayer: "Forgive us all our guilt and accept us graciously, whether they bring the calves as the fruit of their lips. 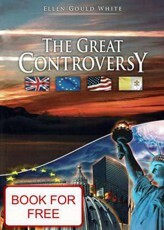 Big fight between Satan and Christ is coming to an end: Satan ranked last forces to act in the drama of human history. In Revelation 12.12 says: "Woe to those who dwell on land and at sea because the devil has come down to you, having great wrath, because he knows that he has little time. Peter 5.8 Be sober, be vigilant because your adversary the devil as a roaring lion, walketh, seeking whom he may devour. What can I say, I woke up the remains of God's people? I saw terrible things await us: Satan and his angels gather all the forces against the people of God. He knows that if they sleep for a while, it is in his hands, and their destruction is certain. Satan will try to stop them from making to prepare for that day. Arrange everything so that they barred the way, is loaded with earthly treasures that had many great concern and that their hearts were overloaded with worries of this life, and the day of the test that surprised them as a thief. Satan's forces are trying to divert people's minds from the eternal values. The enemy directs everything according to its objectives. Minds of men and women employed by secular business, sport and fashion. We must pay attention to a thousand interests. Some things need time and provoke curiosity, but do not make sense. We must devote all their attention and energy to the best interests, although we are often relatively meaningless things. We feel a responsibility, if we give food to my soul to keep the spiritual life and encourage him. Man is by nature tend to follow the whispering of Satan and can not successfully resist the terrible enemy. It can only gain strength from Christ, a mighty champion, if it dwell and follow his inclinations. Satan is preparing his temptations, that the people of God in his last known attack. "Satan is not afraid of anything as the fact that the people of God will remove all obstacles from the path that the Lord can pour out His Spirit." AmazingHope.net - Approaching the return of Jesus Christ, get ready!